This paperback book shows normal wear and tear. This paperback book cover has stickers/sticker residue on it. The edges of the pages have markings, spots, or stains. Shipped to you from Goodwill of the Valleys, Roanoke VA. Thank you for your support! Robert Putnam is a specialist on social capital and civic engagement that he is also founder of a program called The Saguaro Seminar: Civic Engagement in America . One of his major works ?Bowling Alone? is mainly about the decline of civic activities and engagement in American society, its reasons and restoration. Putnam examines the civic structure of American society and changing behavior through twentieth century. He suggests the concept of ?social capital? for measuring the total social connections and activities. In the first part of his book Putnam demonstrates the declining trends of the civic engagement and social capital. The beginning chapters are about shrink of political, civic, religious participation relative to 1960s. In recent decades, people participate less in the political meetings, less reading newspapers and obviously less voting. They are less attending civic organizations, meetings and doing less public service. The existing organizations do not make considerable contributions to social capital. Their membership is based on check signing and the members do not come together. Even though people do less housework, spend less time on child care and have higher education level they are not involving in meetings. Another activator of civic engagement, religion, is also a declining value. The number of non ?believers rose and the number of churchgoers cut down according to the church records. If we add the over reporting of the churches and the Hispanic immigrant churchgoers into the picture that presents the significant decline in native middle class participating religious activities. In the next three chapters is about the decline on the workplace connections, informal social connections and altruism, voluntary and philanthropy. He states our connections are moved to workplace but they became superficial due to competence and more changing jobs. The union membership as a past social capital creator lost its importance according to the changing trends and corruption. Moreover, people does not come together for card playing and making sport that much. 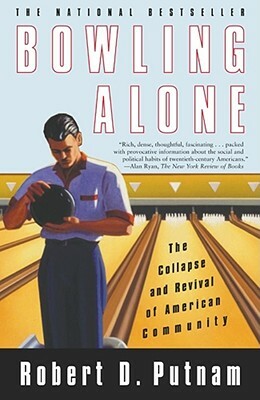 They are choosing individual sports and activities that?s why the book is called bowling alone. Thus readiness to be friend and activities with the friends is also declined. He states that the volunteerism and altruism is in their ?Indian summer? because the old generation is still holding the activities at high levels but it will not survive. Then he stresses on ?thin trust? (trust on anyone that you see on the road) and its importance. It represents our trust on society in general. He says people does not rely each other that the crime rates are risen and the lawyering became important as a consequence. At the end of the first part of book he talks about the new activism with the self- help groups, evangelical activism and the collective marches. He says a new wave of voluntarism is in rise with the young generation and he is hopeful for a new rising trend of social capital. Putnam books second part asks for the reason of the decline after two third of the century. He tests some possible reasons starting with time and money pressure. He argues that people work more hours because of pressure but spending less time for house work. Therefore this change caused less engagement but it is not the leading reason. Second, he tests mobility and sprawl as possible reasons. He argues that mobility is not a new trend. He accepts sprawl is time consuming and isolating people but refuses its being a leading reason. Third, he states similar ideas on television. Television makes people isolated and passive but the absence of it does not lead to a more civic society. At the end, he mentions the change from generation to generation as the leading reason for the declining civic engagement. He says the decline began with people born in 1930s. The negative incidents that the boomers faced such as Kennedy and MLK assassination affected the generation so they mistrust the society and engage less activities. X?ers, the following generation, are more materialistic and more isolated. These two generations more commit suicide and feeling more malaise. He gives the percentages as 50% generation change, 10 % for suburbination, 10% for time and money pressure and 25% for the electronic entertainment. The third part of Putnam book called ?So What?? explains why the civic engagement is important .He argues that children are more successful in education and have less misbehavior where the social capital is high. The streets are safer and people are friendlier in these places. These people are more likely to find job and get promotion with their ties in the community. They are less depressed and healthier than the others. The social capital also helps people to express themselves politically and prevents extremism. However, it is not beneficial with all aspects that the clubs were less tolerant in the past and the social capital creates classes in the society according to their ethnical structures. Putnam analyses as a whole make a vital contribution about significance of the social connectedness in the society. The arguments on this issue subordinated with the monetary and productive issues and social connectedness even seen as old-fashioned. Most of the works about the community effectiveness are established according to economic rules and they were ignoring the human relations and values effects on the society. They were all about the effective usage of human capacity for economic prosperity and ignoring human as a social creature. Putnam work reminds the social capital and gives empirical relationships about its effects to the different areas. Moreover, Putnam supports his ideas with numerous statistics. Therefore, he decreases the measurement errors on hardly operationalized concepts. He gives the data sources, his methods and notes at the end of the book that can be useful for further research. Not only the political scientists but also sociologists can find useful ideas and numbers at this book. He includes some counter arguments such as the rising small groups as a counterargument to declining civic activities in first section and the dark side of social capital for indicating the rise of social capital is not always good in the book what makes his work more reliable. However, there seem to be some small problems about the main reason of the social decline. He differentiates the generations? behaviors according to the major incidents that may effect their character. He attaches the character of the boomers with the MLK and Kennedy assassination and the Vietnam War and argues that due to these failures this generation is passive and not sociable. However, he does not emphasize enough the effects of Second World War on the rise of civic activities in 50s and 60s.The effects of Second World War seems to be more influential than the generation difference, actually it caused the generation difference.